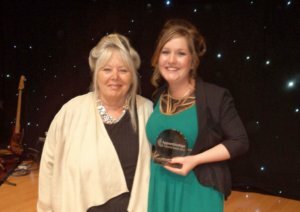 We are proud to let everyone know that we were last night celebrating the success of our Accounts Assistant Alice Hawke who has won the 2012 Yorkshire and Humberside Higher Apprentice Award. The spotlight shone on Alice (pictured above with our MD Linda Hinchliffe) as she was recognised for the outstanding contribution and dedication towards her work and the apprenticeship programme and is an integral part of the team here. The award ceremony took place at the Leeds College of Music, which is one of 12 regional heats where all the winners will be put forward to the national judging panel and could be in with a chance of celebrating their success together at Europe’s largest skills and careers event; The Skills Show – at the NEC in Birmingham in November.